It’s a great joy to see my little one growing each day. His father says he sees something new in him when he comes back from office. Some days he says some new words and some days shows new feelings. Though it’s too early to say, but till now he has grown to be a good hearted person. He is kind to everyone. Even on the road if someone coughs he would put out his water bottle for him drink. If anyone in the house ever falls sick he would be there at his bedside asking whether he needs water or medicines or anything else. And after providing that, he would ask ‘akhon thik lagche?’ are you feeling better. He would even offer to massage your forehead if you retire to bed early. Will bring cream and apply to your leg you complain about muscle pain or if he thinks your legs are paining. Its another matter that he would even offer to press your neck if you complain about neck or throat pain. right now am down with viral fever and pharyngitis. My domestic help 'B' just made a cup of hot tea but am so lost in my blog world that the tea went cold. And you wont trust but my lil one just lifted the cup and with utmost care took the cup to the kitchen for 'B' to reheat it for his mumum. It was a sight to watch him walk in such small steps with a very serious face not to splash a single drop....which brought tears to my eyes. He is very helpful in the kitchen too. When I cook he would always be there at my side. Offering to tip in the potatoes or sprinkle little more salt. Once am done he needs to taste the dish to check if the seasoning is right. After I give him a spoonful of the curry, with a serious face he would declare 'Nun thik ache/(rightly seasoned)'. He loves animals and almost everyday pleads to us to get him one doggy. Remember this post where he was excited with the fishes Hubby caught from the road? now my younger brother has got him one. They together have named him 'Nemo'. Now with Nemo and a little piece of this murabba on his plate makes it easy for me to feed him. Maa made this for her grand children and they instantly loved it. Niece calls this Churabba for some unknown reason and my little brat is too philosophical to think about the name. As long as he gets his share of that sweet little piece, he is satisfied. Murabba or morobba (in Bengali), or preserved fruits in thick sugar syrup, is an Arabic word that refers to savory or sweet jam or pickle in many regions of Pakistan and also Gujarat region of India. Traditionally it is sweet, prepared with raw mangoes, sugar, and spices. This fruit pickle originated in Gurjistan, Republic of Georgia, where they used to make it with cherries and strawberries. But when 'The Gurjars travelled to India to escape invaders, migrating to three regions of modern day India, (Rajasthan, Gujarat and North Jammu, and the Northern Pakistan area of Gujarat. the Gurjs or Gurjars initially settled in Gujarat and hence Gujarat got its name.' ) they used the same process to preserve local mangoes. This also is a tea time favourite in azerbizan which is known as Murebbesi. Check out Farida's space for more murabba recipe made with quince and watermelon rind. The recipe am sharing here is our family recipe or more or less the recipe in which morobba is made in Bengal. Still I have not tried my hands in this and am just typing down the recipe as told by my Maa. Now, You know how it is with mothers, they never take the actual measurement and will expect you to figure that out on your own. I tried to be as specific as I can and I think you would be fine if you just follow this and apply little bit of your cooking skills. Recipe is easy but takes little bit of time. But if you have a sweet tooth you would not be disappointed at the end. You would be rewarded with an awesome delicacy of sweet, succulent and juicy pieces of raw mangoes in honey smooth golden syrup. There are two ways of cooking this Murabba. We followed the first one. Before you start preparing the mangoes, soak the chun in ½ bucket water and keep aside. Peel the skin of the mangoes and poke the flesh with a fork at several places. Cut in half, remove the seeds and then make small cubes. Soak the pieces in the water for 3-4 hours. At the end of this time drain the water completely and spread them on a plate to dry for 10 minutes. Switch off the flame and keep it (covered) overnight. After 24 hours, add one part sugar to the cooked mangoes and again cook it for 5 minutes. Finally on the third day (after another 24 hours) add the remaining sugar and start cooking it on low flame. Lot of impurities will come on the surface. Take it out with a splotted spaula. Add the raisins. Continue cooking on low flame. The syrup should reach the consistency of honey and quantity should be enough to soak all the mango pieces in it. At the end of this process the mangoes would be tender and will soak the sweetness from the sugar. There would be a luscious sheen on the skin of the mangoes. Roughly grind the cardamom pieces and mix it in the syrup. Let it cool completely, then pour out in sterilized jars. It stays good for almost a year. no need to refrigerate. Alternatively you can also cook it on the same day. To do this prepare the sugar syrup with all the sugars and put in the mango pieces. Keep on cooking this on medium heat, stirring occasionally. This will take as long as 2 and half hour to 3 hours. At the end add the raisins and cardamom powder. Cool and preserve in jars. This process needs a lot of patience and attention for a long long time, and also the Gas bill will soar up. For these I prefer the first option and also the mango pieces soak the syrup better during the resting time in between. You can flavour it in anyway you want. I have seen my dida flavouring it with fennel seeds, to which she used to pour in a tbsp of warm ghee at the end. Cinnamon could be a great flavour for this preserve as well. You can make quick chutney with this preserve. Just thin the syrup with little water. Heat a spoonful of oil, temper it with panchforon and dry red chillies. Add the preserve, a pinch of salt, chilli flakes and a dash of lemon juice. Delicious chutney ready in almost no time. 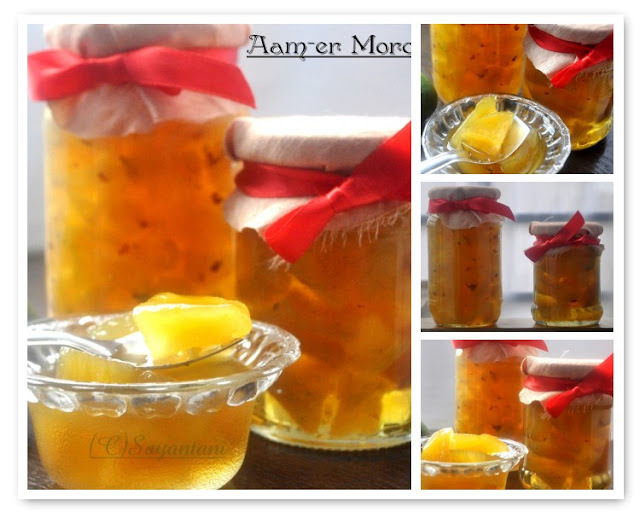 Following the same procedure you can also make pineapple Morobba (recipe coming soon) and amloki’r Morobba or preserved Indian gooseberries. SLurp,mouthwatering here,wat an incredible and fingerlicking preserve..
Yummmmm.... looks so delicious. I haven't heard of this recipe. Love it. Ur lil one is really cute. I really liked the way he helped warming ur cup of tea. really cute :-) Thanks for stopping by my blogs. Actually i made salad with the radishes :-). Glad to be following ur blog. u have agreat blog. Sayantani..firstly your son is an absolute darling.master taster aache boleyee tomar ranna gulo eto osadharon darun hoye:)write up and images of the morobba is awesome!chobi aar golpo shuneyee appetite filled hoye jaye.I enjoy your posts way way too much.Ranna r sathe bhalo golpo...both are deadly combination to get hooked:)I am surely going to make this one.Indian store here has some good raw mango now. Mouthwatering here,will surely give this a try..
Aamer moraobba and kosha mangsho .. slurp slurp !! you will know what i mean .. bong connection :) I made ammer chutney the other day .. super delicious. Your son is so sweet :) Mango preserve looks delicious. Love your pics and presentation Sayantani..
wat a fab idea dear.. Looking absolutely fabulous and delish. Wow, I love morobba and its been long since I had this..yours look so tempting and delicious..feel like tasting some now..YUM! wow,this looks so delicious,.jar reminds me of dadi,. @Amritha, Thanks a lot dear. you made my day. @Kankana, yeah!! !thats a great combo. @Lena, kitchen affair, Akeela thanks a bunch buddies. @Jay, Sangeeta, Chandrani, Varunavi...no this one is made by my mom. @pushpa, padhu, nisha, suman great to know that you liked it. am not happy with the clicks though. @Sharmila, darao erpare or dustumi'r katha likhbo. I loved reading about your son. May God bless him. wow, love that idea !!! Your son is very sweet! I am new here and absolutely love ur space.. and following u for more wonderful creation of urs.. Your little one is such a sweet angel! Best wishes of recovery to you! Morobba looks so delicious and mouth watering. Love reading your post. Your son sounds like an absolute blessing, so cute! What an amazing looking murabba! Tiring job, but it looks so delicious & a beautiful color. Wow - I'm sure those are tasty, but beyond that, they are SO BEAUTIFUL! Glad I found your blog! fab dish and fab pictures! You son is fab! The little darling! Your mango preserve looks wonderful. I would love to try it. Thanks for sharing it. looks yumm and beautifully preserved...you have a lovely blog.Glad to be follow your blog.